Jan Brett's stories are always some of my favorites. 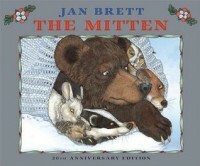 I like The Mitten because its a great sequencing story for comprehension. There are so many great activities I've seen on Pinterest with this book for retelling and sequencing. The illustrations are so pretty which makes it appealing to kids. I think it would be better for k-2 classrooms.